...the 19th Century, that is! I've never been much for historic re-enactment, but after yesterday I'm revising my opinion. 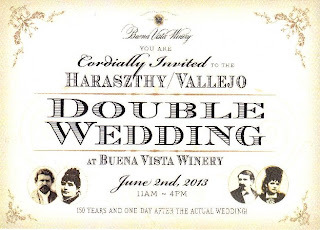 I was one of about 100 guests invited to witness the recreation of an 1863 double wedding--150 years and one day after the actual event--that united two of the most powerful families in California: the Vallejos and the Haraszthys. In case you're not up on California history, General Mariano Vallejo founded Sonoma in 1835 as a military outpost on what was then Mexico's northern frontier (many of the buildings he constructed remain in use on the town's central plaza). "Count" Agoston Haraszthy, a Hungarian nobleman, founded Sonoma's Buena Vista Winery in 1857; it was the state's first commercial winery and Haraszthy is recognized as the "father of the California wine industry." Both Vallejo and Haraszthy were brilliant men with powerful personalities. When Haraszthy moved to Sonoma in the mid-1850s with his family, the two men hit it off. 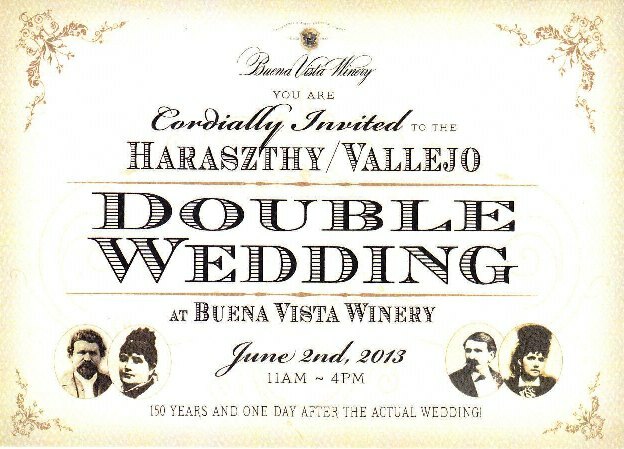 Apparently their children did as well...leading to the double wedding between Attilla Haraszthy, 28, and Natalia Vallejo, 25, as well as Arpad Haraszthy, 23 and Jovita Vallejo, 19. Yesterday's recreation took place on the grounds of Buena Vista Winery, whose 1857 and 1863 buildings were completely renovated and retrofitted last year by the winery's new owner, Jean-Charles Boisset of Boisset Family Estates. The wedding took place exactly at noon outside the 1857 winery building. The service was a short distillation of the long original, but it was historically accurate. Afterward guests made their way down the official receiving line, shaking hands with all the Vallejos and Haraszthys. And then it was into the winery building, where a magnificent feast was laid out. Ten tables were set out in one of the big rooms; the day was hot, but inside that old stone building it was nice and cool. We marveled over the fabulous food, drank fabulous wine, laughed at champagne toasts to and by the wedding party. I was thinking that my date, Richard, and I had the great fortune to sit at a rollicking table of extroverts, but then I looked around and saw that all the tables were on fire with fun. It was just that kind of event. After lunch we reassembled outside to cut the wedding cake and then slowly, inevitably, wandered back the pathway to 2013 and everyday life. But the glow--ah, the glow!--lingers on. Count Haraszthy and his wife, Eleonora, walk down the aisle. Here's General Vallejo walking his daughters, Natalia and Jovita, to meet their future spouses. The priest stands waiting, the two couples at his side. The entire wedding party (Buena Vista Winery owner J-C Boisset is at far right). Preparing tables for the feast. My favorite "What century am I in?" moment of the day, wherein Count Haraszthy can be seen taking a photo. Here I am with the Count on the left and the General on the right. I've interviewed the Count on many occasions for various articles, but had never met the General before.